According to a recent study, 84% of college students have at least one credit card — but only 17% pay off their cards in full every month. By the time the average student graduates from college, he or she has racked up $4,000 in credit card debt — a troubling burden, especially in a stressed economy with fewer jobs at less pay for recent grads. Part of the problem can be traced back to the credit card companies themselves, which give students without full-time — or even part-time — jobs high credit limits. Theoretically credit card applicants are vetted thoroughly before establishing a credit limit, but in practice, students were getting cards with limits of up to $5,000 and more with no proof of income. 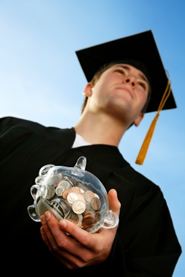 The average college student has more than $4,000 in credit card debt when they graduate. All that changed when a new law went into effect. The Credit Card Accountability Responsibility and Disclosure Act of 2009, which took effect on February 22, 2010, prevents students from obtaining a credit card unless they have sufficient income; those without sufficient income must have a parent or other adult (with sufficient income) cosign for the card. Then, if a student defaults on his credit card agreement, the company will turn to the cosigner for the balance of the card. The law would also cap the amount that student cardholders could borrow at $500 — or 20 percent of their annual income, whichever is greater. And if you wanted to up your line of credit, you would have to send in written consent from the co-signer. Other changes include a ban on credit card companies soliciting students on or near campus and giving away freebies such as t-shirts and free pizza. Credit card statements must also now clearly state how long it would take to pay off the balance of the card if one was only making required minimum payments — along with the total amount of interest one would pay doing so. If you already have a credit card, these new rules don’t apply to your accounts. If you sign up for a new card, however, you can expect a more stringent application process and tighter regulations. No matter what kind of credit card you have, you definitely want to manage it responsibly. For help in that, check out my post from last fall with 3 lessons in managing your credit cards.